Mrs Meadowcroft had always wanted to make a statement with her staircase, as it is the first thing you see when you enter her lovely home. After consulting with a few different companies, she much preferred the online quotation approach of First Step Designs. 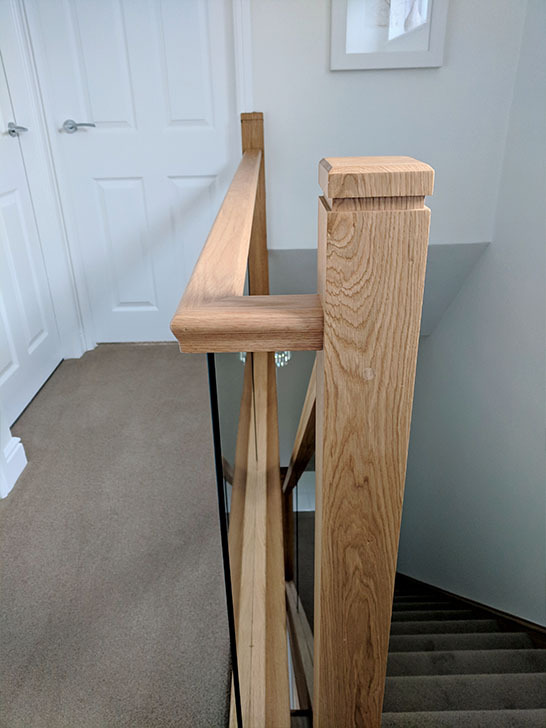 After our initial quotation, we visited the Meadowcroft home to share samples and drawings of her staircase for her to be 100% happy with the final design… She was not disappointed. 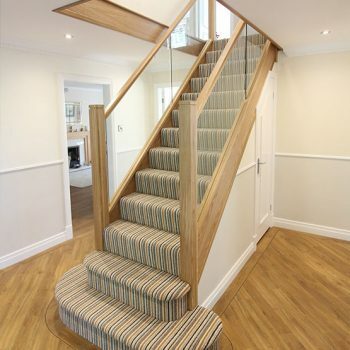 The original staircase was very similar to most homes that have been built over the last 15 years. A typical softwood and MDF construction with a traditional turned spindle, all glossed white over the years. 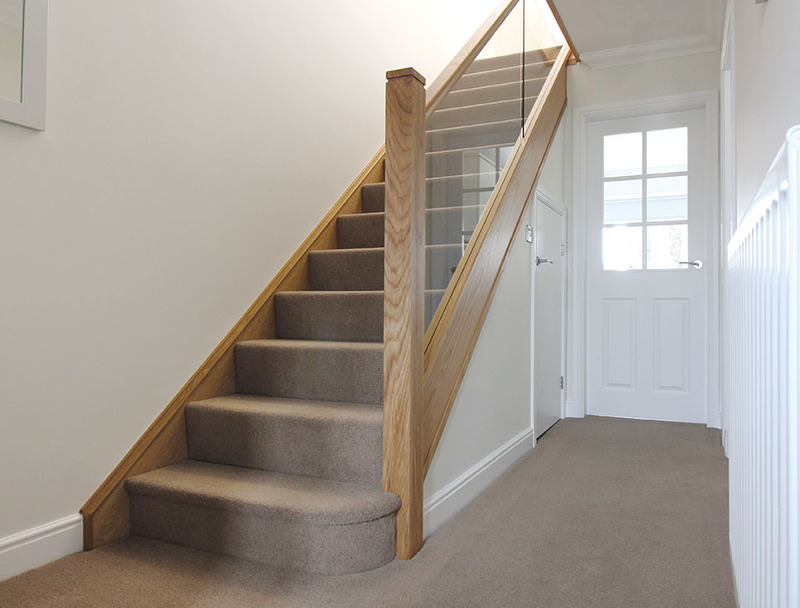 We have renovated hundreds of these staircases over the years and our process is absolute. 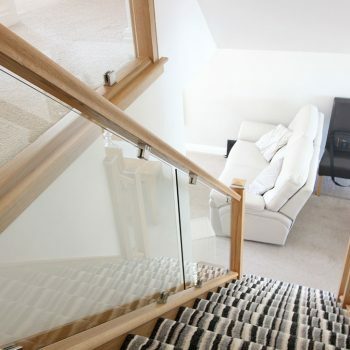 We remove all components other than the structural strings (sides of the staircase), that cannot be removed. 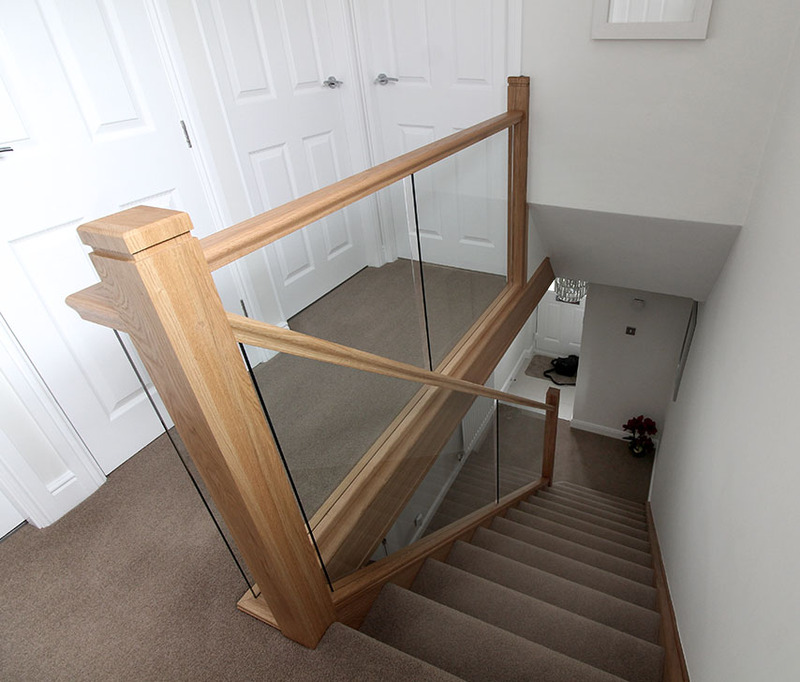 This includes replacement newel posts, handrails, baserails, nosings and new glass balustrades. 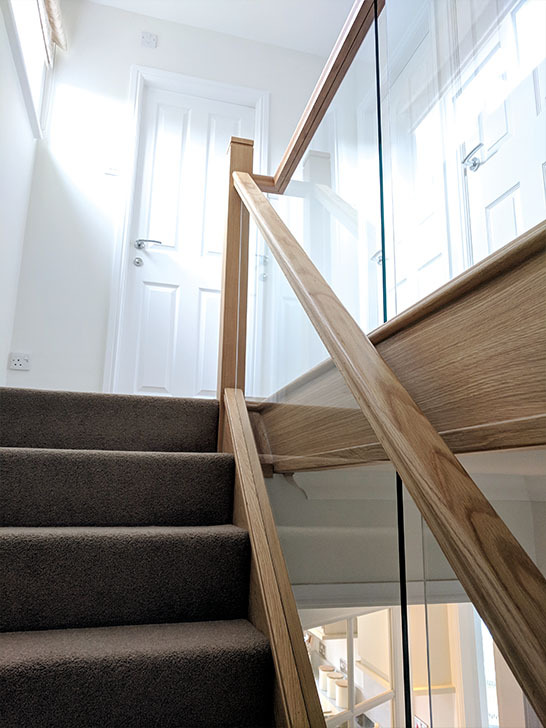 The areas that cannot be removed are clad with a 6mm oak veneer that is cut to perfection and scribed to the exact shape of the staircase. We use this same cladding on all the sides of the staircase (strings) and the apron too. 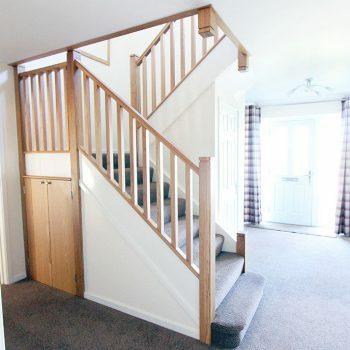 The apron is the vertical section between the downstairs ceiling and the upstairs landing balustrade. 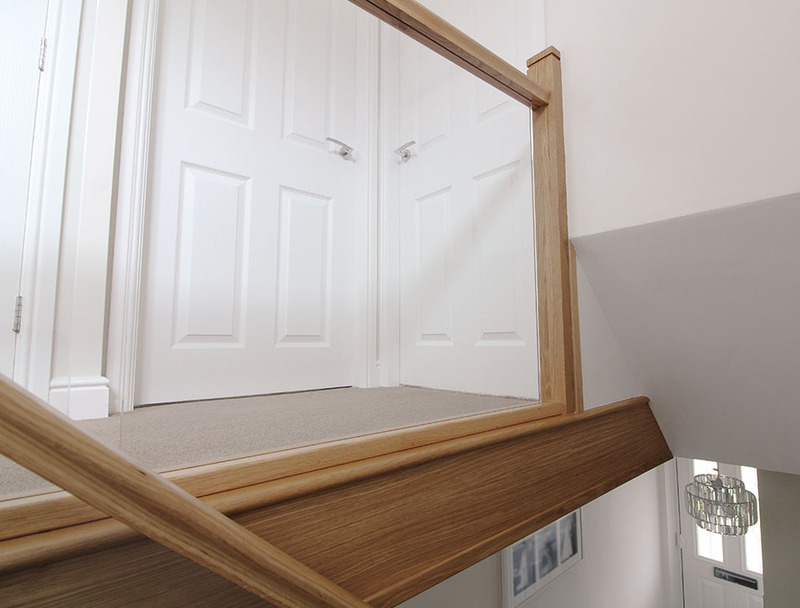 This frames the well opening for that final touch of elegance to complete the staircase renovation. 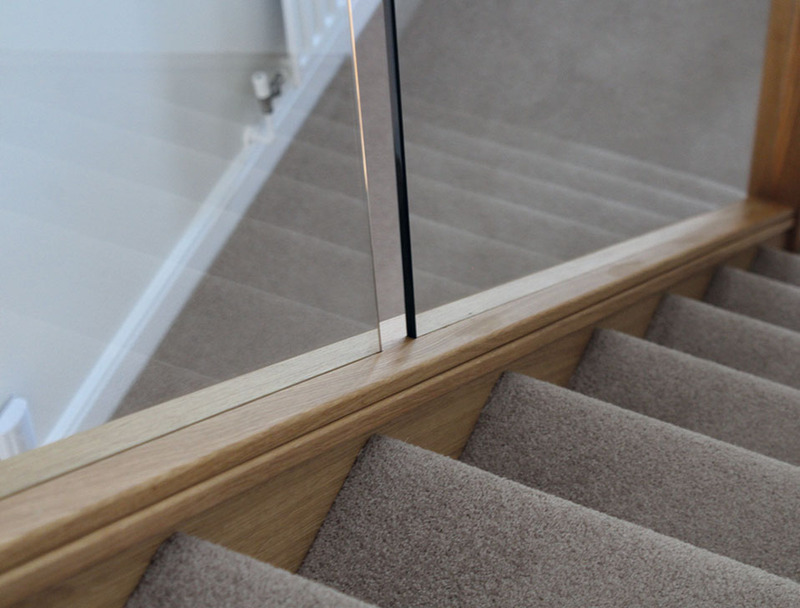 There are a variety of glass styles available in terms of colour and fitting method. Choose from clear, low iron, bronze, grey tint or etched touched glass panels to compliment your interior. Once chosen you can then choose from in-line (embedded) fixing or a steel clamp to hold your glass in position. Call today to find out more about our renovation services.